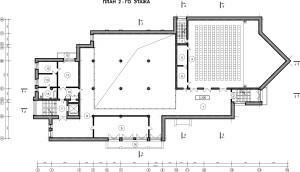 The first floor will include the double-light prayer room, the rooms for priests and a charitable cafeteria with Tibetan cuisine (a dining room for 80 people). 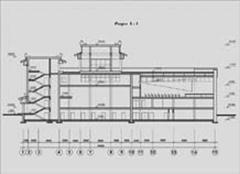 The second floor will include a conference hall (about 250 seats), a meditation hall and classrooms for the Buddhist spiritual teachers. 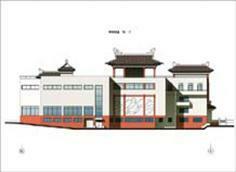 The third floor will include a library of spiritual literature and an administration office. 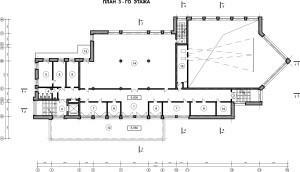 The basement floor will accommodate an oriental medicine center with a necessary number of units for reception of patients, an ultrasound room, a chief physician office, a reception area with a registry office, a pharmacy and a wardrobe for visitors, some waiting space and a number of technical facilities. 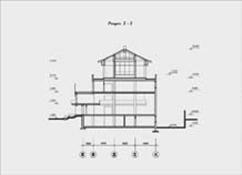 The building will be equipped with a cargo-and-passenger lift and the dining room will be equipped with a lift for technical needs. 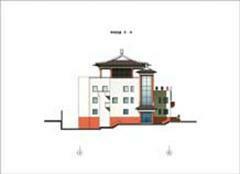 There will be an access ramp for disabled persons in front of the building. The Temple’s territory will be developed and landscaped. The natural light can penetrate into the basement rooms due to the artificial ground level lowering. From the ground remaining after refilling the trench, two artificial terraces will be constructed and connected with the stairs leading from the Holy South Gates to the Temple Doors. 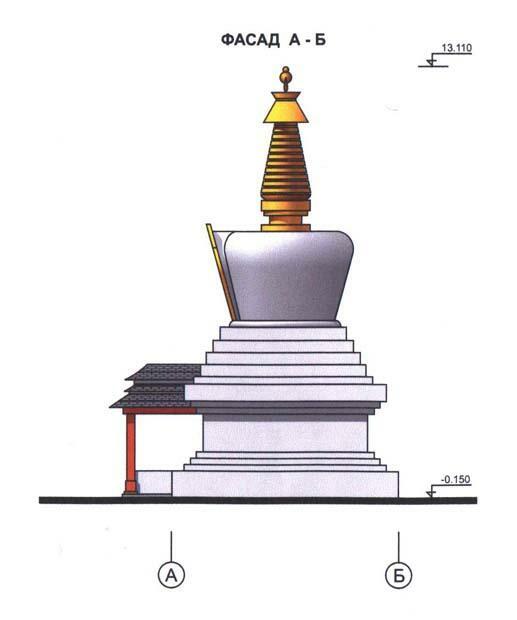 It has been decided to allocate a piece of land for installation of small religious symbols of foreign Buddhist countries that may be willing to make donations for the Temple construction. 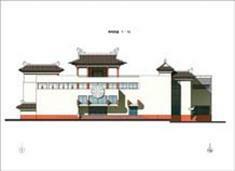 The Temple will be encircled by the fence with the Holy South Gates. 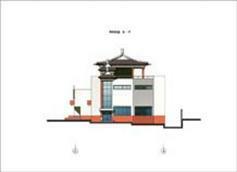 The Small Temple (an auxiliary building) will be a one-story capital building with a basement. 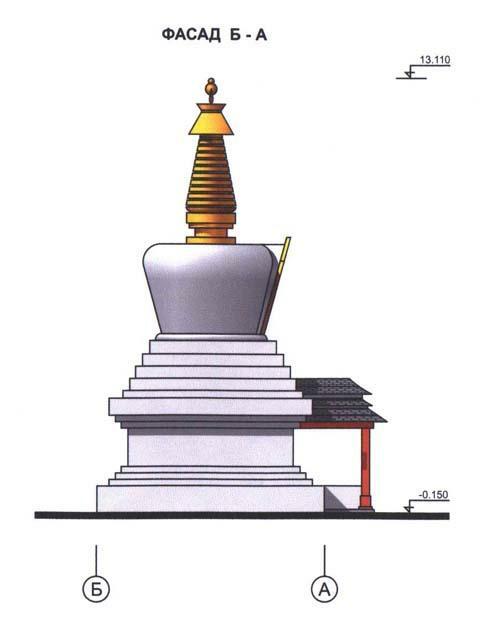 The Stupa of Enlightenment will be built on the Northern side of the Temple, at a short distance from it, situated on a common central line passing through the Holy Gates, the main doors of the Temple and the principal statue of Buddha. 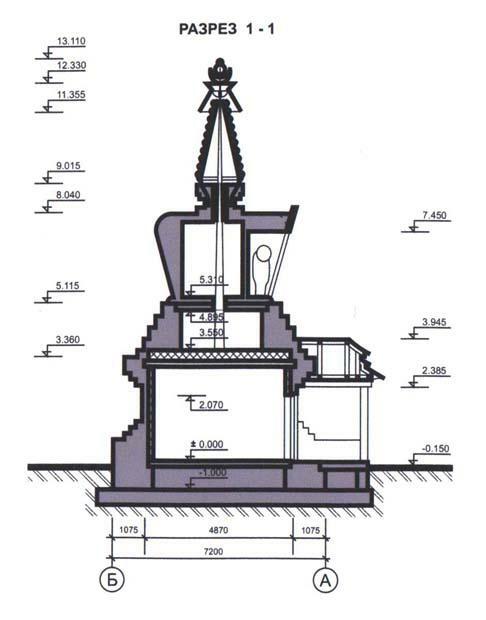 The Stupa of Enlightenment is a capital building of three levels for ceremonial purposes intended for the year-round but occasional worship. Only the places of a lower ground level are intended for visiting by the faithful. 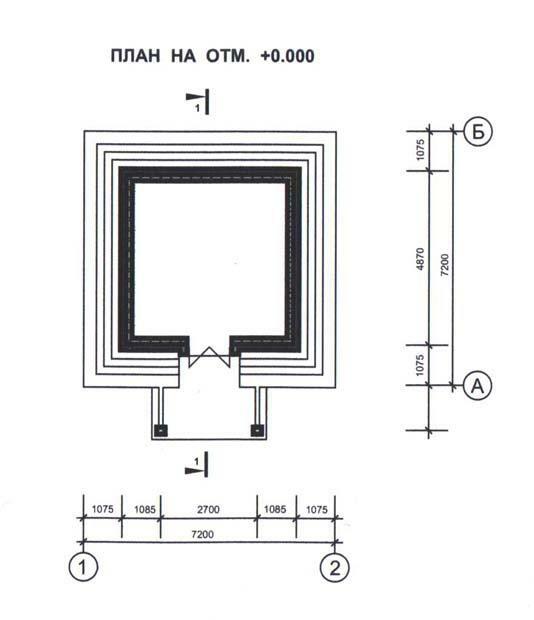 The premises of the two upper levels are intended for storage of sacred relics and are actually isolated rooms with no external access to them (access to each chamber is executed only once – immediately after construction of the corresponding level, then the floor is erected, and the chamber is becoming isolated according to its religious purpose). An outdoor niche for installation of the Buddha statue in it will be also erected on the third level. 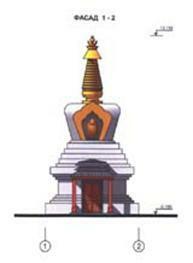 A conical roof-shaped cover with decorative elements in a form of the Moon and the Sun will be elevated above the three-level structure. 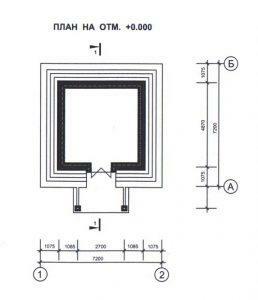 There will be also a space for keeping the relics under the floor of the ground level. This space, as well as the two upper spaces, will be an isolated chamber (inaccessible after erection of the floor on the ground level). 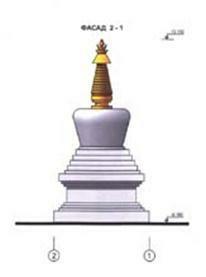 The sacred wooden conical pole sakshin will be erected on the floor of the second level. This pole will pass through the floor over the second level and through a concrete shell over the third level along the entire height of the conical cover and will be fixed (clamped) on the level of the metal decorations over the cover.